Terrified Berliners struggle to survive each other and their own failing bodies during a sudden epidemic of progressive paralysis. A fast-spreading epidemic of progressive paralysis has stricken Berlin, killing most of the city's inhabitants in a matter of days. Trapped within their own bodies, the paralysis spreading from limb to limb, the remaining survivors are isolated and dying--except for a few. Those few who can still walk may be more deadly than the epidemic itself. Benny Berg seeks to save his father, Ivo. Partially crippled Katrin is stalked by someone who wants to kill her--or worse. Almost incapacitated, Marieke drowns herself. Meat cleaver in hand, Niko grows increasingly frustrated with her "dead" limbs. Rudi suddenly finds Berlin ripe for the taking. Pastor Bernhard preaches to a spastic flock of parishioners. And Captain Hofler firmly believes the military is coming--but to incinerate everyone. 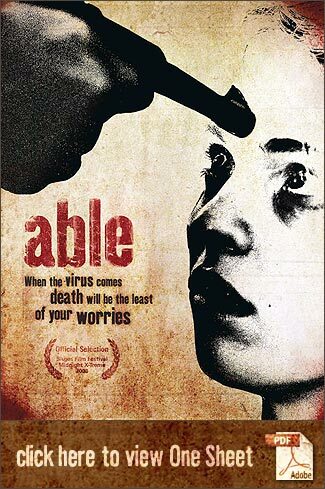 Able delivers unspeakable acts of violence, sexual deviance, and human madness in a gritty, stylized take on the survival horror subgenre. When you can't run, you can't hide. Who is this film for? Audiences for this film range from the casual consumer of thrillers (18 to 50 m/f) to the more selective yet vocal horror film fan base (18 to 35 m). A strong running social commentary interspersed throughout makes this suitable also for arthouse patrons (30 to 45 m/f) that seek transgressive films. Filmed on location in Berlin, Germany.